No such thing as boring maths! Armagh Robinson Library has launched its latest temporary exhibition on the subject of Mathematics. The display shows books from the seventeenth and eighteenth centuries and highlights the works of leading mathematicians including Sir Isaac Newton, Jacob Bernoulli from Switzerland, and Maria Agnesi from Italy. The exhibition, which will run until the end of September 2018, coincides with the University of Oxford’s project, ‘Reading Euclid: Euclid’s Elements of Geometry in early modern Britain and Ireland’. The Greek mathematician, Euclid, is often referred to as the ‘father of geometry’. His ‘Elements’ is still valid today, and served as one of the main text books of mathematics from its original publication in 300 BC until the 19th century. With the invention of the printing press, it was one of the very first printed works on maths. Jacob Bernoulli was one of a family of mathematicians. He is remembered especially for his contributions to calculus and to probability theory. Maria Agnesi was the first woman to write a mathematical text book, and also wrote the two volumes on integral and differential calculus. The 1775 edition is a French translation of the second volume and is included in the ‘Registres de l’Académie Royale des Sciences’, which was a great privilege. Her work was highly regarded throughout Europe. In 1749 Agnesi was made Honorary Professor of Maths and Natural Philosophy in the University of Bologna, and so became only the second woman to hold a university chair. 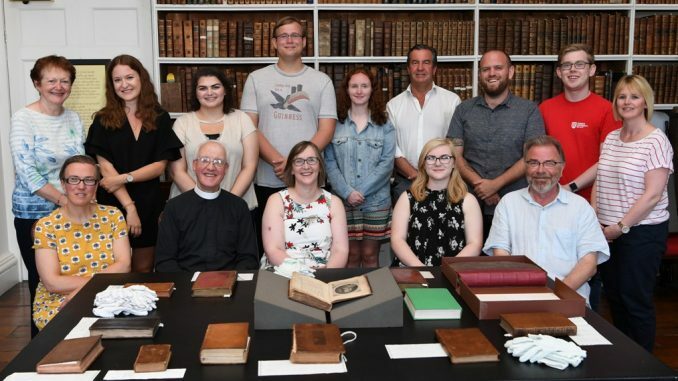 The exhibition was launched by students attending the Queen’s University, Belfast’s Irish Studies International Summer School, who came to the Library for a seminar. Summertime at the Library and No 5!